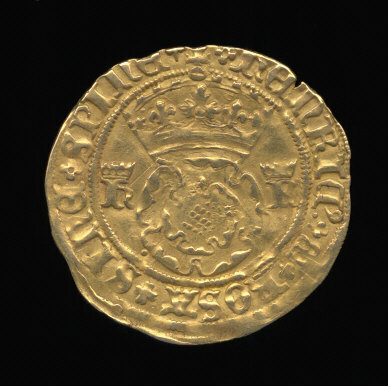 In the Reign of Edward IV (1461-1470) the first coins of the value of 5 shillings were struck in the form of a half-ryal of gold and weighed 60 grains. No further coins of this denomination were struck until the reign of Henry VIII in about the year 1526. These were 22 carats fine and weighed 57 21/57 grains. His later crowns dropped in fineness to 22 or 20 carats and weighed only 48 grains. The first issue of Edward VI (1546 to 1533) was of similar weight and fineness. His subsequent issues were of restored fineness but the weight was further diminished. Elizabeth I (1558 to 1602) issued crowns which were initially valued at 3s 4d. Later in her reign (1592 onwards) they were once again valued at five shillings. The weight had stabilized at about 43 7/11 grains of 22 carat fine gold. James I (1603-1625) issued crowns or quarter-laurels valued at five shillings. Additionally he issued Britain Crowns and Thistle Crowns which were of varying values. The former being 5s or 5s 6d and the latter being 4s or 4 ¾d His crown was slightly less than the preceding, and nominally weighed 42 66/67 grains, with the Britian Crown, Quarter-Laurel, and Thistle Crown weighing significantly less, though of the same 22 carat fineness. Charles I (1625 to 1648) also issued the Britain Crown, and his was worth five shillings and weight 35 5/41 grains of 22 carat fine gold. This coin was continued in the Commonwealth (1648 to 1660) at the same standard and weight. The last gold crowns were struck during the first coinage of Charles II (1660 to 1684). The first silver crowns were struck by Edward VI in 1551. These are also the first English coins dated in numerals.